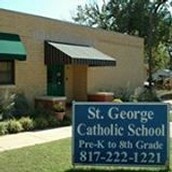 St. George Catholic School, a ministry of St. George Catholic Church, is a multicultural community serving children in the Fort Worth metropolitan area by providing a diverse education in a safe, supportive environment promoting Catholic values, academic excellence, and social responsibility. We are excited you chose St. George Catholic School as your child's academic institute! The information below provides you with a few important things to know before school starts. Feel free to contact the school office at 817-222-1221 should you have any questions. You can also email the school secretary, Mrs. Sollie at fsollie@sgcsfwtx.org, or visit the school website for information. Help is needed getting the school building and grounds ready for your children. Below is a list of volunteer opportunities. Hours will count towards your required 30 volunteer hours. Contact the school secretary for more information. Join us for "Business Night" at St. George. This is a great time to come and hear information on school policies, pick up school supplies, pay tuition, get help with RenWeb & FACTS, sign up for HSA committees, learn about Dad's Club, sign up for volunteer opportunities, coaching opportunities, etc. This night is all about business! Continental breakfast held in the SAMS room. This is a meet and greet social for all St. George families. Join us for "Welcome Back Night". We will start the evening with a short HSA informational meeting and student performances before you get the opportunity to meet your teachers and see whats happening in the classroom. Please make arrangements to pick up your child(ren) at noon. Parents are invited to help plan for this year's Fall Carnival. The meeting will be held in the 8th grade classroom. Room parents, or their designee are required to attend this planning meeting. Contact the Home and School Association at HSA@sgcsfwtx.org for more information. Join your principal for an informal talk on current events, curriculum trends, parent resources, and other topics vital to student success.